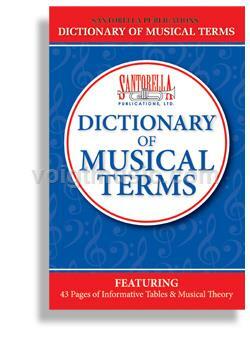 Santorella’s Dictionary of Music Terms, packed with over 2,500 concisely defined music terms and theory reference charts, serves as a fantastic “quick” glossary guide for study of music. The alphabetic listing of definitions is expected, but the additional reference materials including Notation, Meters, Key Signatures, Scales, Modes, Intervals, Signs, Composers, Periods and Seating Arrangements for assorted ensembles set it apart from any other pocket dictionary in print. This Santorella Publication is an absolute must for every music student.